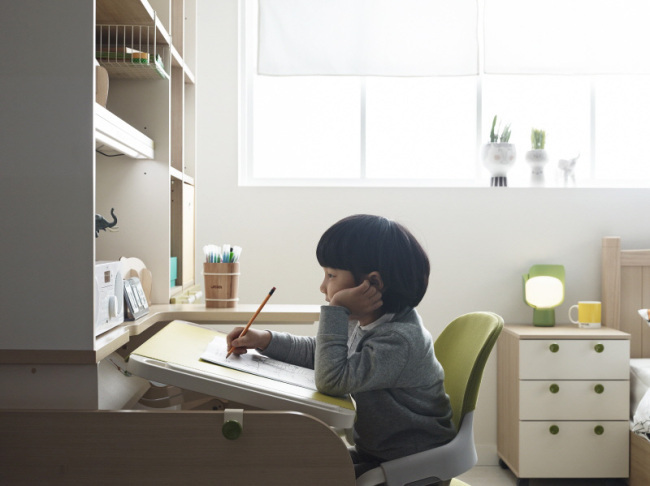 Six-year-old Kim Lyu-hyun has yet to start school, but he is not new to sitting tight for a few straight hours to study. The child is comfortable reading and writing in his mother tongue, can add and subtract below 20 without errors -- and without using his fingers to count -- and claims to understand why one plus infinity is still infinity. He currently attends a thrice-a-week, three-hour intensive course on English, a language he rarely hears or uses outside the classroom. In South Korea, a country notorious for its obsession with early education, Kim is not exceptional. Two weeks away from their first day of school, many of the 470,000 soon-to-be first-graders in South Korea would by now know how to read and write in Korean and do basic math, say parents and teachers. Driven by parents who want their kids to excel, the race to prepare soon-to-be first-graders for school has created a lucrative market of private tutoring, preschool education materials and hagwon, or private academies. Such preparation programs for children aged 6 or younger made up a market worth some 3.2 trillion won ($2.79 billion) in 2015, according to one study. And this is expected to grow, observers say, as long as parents consider the nine-year compulsory schooling here as the start of a long and crucial race that will shape their children’s chances at top universities, decent jobs and a comfortable life. Housewife Park In-suk is one contributor to the preschool education market. The 34-year-old mother recently decided to enroll her 4-year-old daughter in a four-week winter program at a private education institute in Daechi-dong, southern Seoul. The course, which is on top of her daughter’s regular kindergarten curriculum, costs over 1.5 million won. “It can be a bit exhausting I know, going through all the intensive studies for a little kid like her, but I don’t want my daughter to get anything less than my neighbors,” she said. Another mother, Kim Ji-soo, 32, said her family spends up to half of their monthly income on the private education of her son, who attends a full-day course for soon-to-be first-graders at a hagwon. Teachers there focus on improving pupils’ reading and writing skills, both in Korean and English, while conducting daily tests on other subjects, she said. “I’m thinking of going back to work to supplement my son’s education. Our budget for living essentials is tight, because of the high education spending and a mortgage,” she said. Parents who used to object to the idea of early education eventually feel the pressure when their kids approach the age when they must enter school. Some of them say they realized too late that there was no escape, as Korea is supercompetitive. “I thought that I was being a thoughtful mom by trying not to be carried away with this education fever and not teaching my kids things too early,” said Kim Mun-jung, whose first daughter is to enter school this March. Kim said that since January, she has made her daughter study Korean and basic arithmetic daily. In some ways, there is a positive side to overzealous parents’ desire to see their children excel in school and the peer pressure it has on other parents. South Korean students’ performance in the international test called PISA, or the Program for International Student Assessment, was among the top eight in the Organization for Economic Cooperation and Development in 2015. But private education from an early age is unhealthy and unsustainable, experts warn. “One of the most perceived notions in early childhood education studies is that a heavy study load can have a bad influence on children in the course of their physical development,” said Gu Bon-chang, an activist at a Seoul-based civic group, World Without Worries About Private Education in Korea. Parents’ zeal for their children’s education is real, but in many cases, kids are being sent to one hagwon after another because both parents work late, he said. Insufficient social infrastructure for child care and a workplace culture that is unfriendly to working parents all play a part in the private education boom, he added.